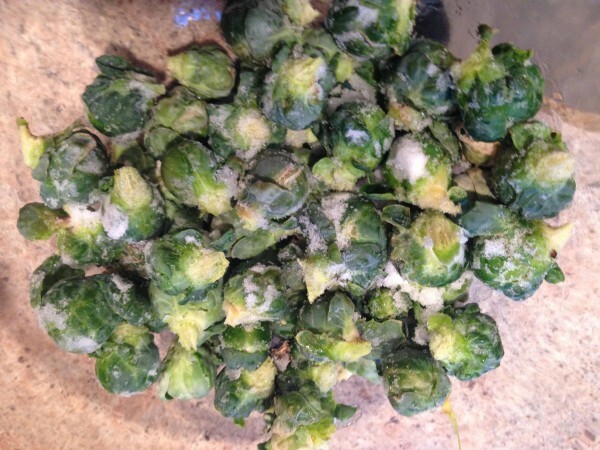 Brussels sprouts, still with snow on them. There are actually some advantages to gardening now. For one, weeds are mostly a non-issue, as is watering since the sun is so low and won’t dry out the soil. The other, as mentioned before, is taste…lots of vegetables taste great this time of year since they up their sugar level to deal with cold temperatures. There is some prep work needed. For example, for root vegetables like leeks, carrots, parsnips, salsify, and beets, you’ll need to cover them with a thick layer of mulch. Autumn leaves are a perfect, and free, material to mulch them with, just cover them with 6-10” of material. You can grow a variety of greens in winter, such as arugula, kale, spinach, Asian greens, etc. However, for these plants, you’ll need to give them more protection. Many gardeners say a cold-frame greenhouse is a great investment, but you can come up with cheaper solutions. You can make an in-garden hoop house by bending plastic pipes over beds, securing them, then attaching plastic sheeting or floating row covers. Just remember to clean them off the best you can after a snowstorm. An added benefit to these sorts of covers is pest protection. While there aren’t any bugs out right now, there are marauding bands of hungry deer that will see your garden as a source of food other than tree bark. One thing to keep in mind that might be surprising about greenhouses. If you invested in one, be sure to vent it on sunny, mild days. Believe it or not, you can end up cooking your plants due to built up solar heat if you don’t vent. So, with a little planning in a few months, you can surprise your friends and family with fresh garden produce next winter.